A Chelmsford Conservative MP has called for a ban on low level letterboxes on new properties to help postal workers avoid back and pet injuries. Vicky Ford called on the Government to amend building regulations to require letterboxes in new buildings to be positioned above a certain height. "The purpose of the Bill is to improve the health and safety of workers particularly postmen and women, paper boys and girls and other deliverers "I met the Communication Workers Union, they told me the key issue for their members and it's not Brexit, it is low level letterboxes and dangerous dogs. Now I am not asking home owners to retrospectively change their existing letterboxes or replace their front doors. When it comes to front doors, a lot of people are very fond of their knockers. "This Bill simply wants to stop developers from building swathes of homes each with a letterbox placed near the ground and I hope that this will be a moment of unity in British politics." 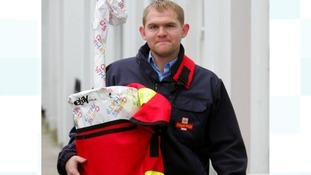 Postmen and women she said, were now delivering fewer letters but many more parcels due to people ordering goods online. Low level letterboxes she said put a strain on the deliverers' backs. She added that Low letterboxes are also associated with an increased likelihood from injury from dogs or cats. "Each week across the UK there are on average 44 dog attacks on postal workers and 50 attacks from cats every year," she said. Mrs Ford joked: "We all do need to declare a bit of an interest, we politicians have been known to deliver an occasional leaflet ourselves maybe." "Not all European standards are evil."